Dedicated AAA single-player games are hard to come by these days. With the recent success of multiplayer-only titles such as Call of Duty: Black Ops 4 and Apex Legends, developers and publishers alike can’t be blamed for chasing the trend. But 4A Games has been steadfast in their focus on the single-player series Metro. Have their five-plus years’ worth effort paid off in Metro Exodus? Only one way to know for sure: read our Metro Exodus PS4 review! Metro Exodus takes place in a variety of locations across Russia. Naturally, the first location is within familiar territory for fans of the franchise. But as the story progresses, Artyom is quickly taken out of his element, and into the sprawling wilderness. Metro Exodus really changes things up by largely eschewing the corridor-heavy encounters of its past, though there are still areas that incorporate this. It’s a good change of pace, and just when one area feels like it might be overstaying its welcome a big event occurs, and Artyom and what’s left of his Spartan gang move on to “greener” pastures. Or at least pastures where they’re less likely to be killed. The story has some interesting concepts, such as a good parallel for Plato’s Allegory of the Cave: how do people react when their entire reality is shown to be a farce? Some of the story is told through some awkward sequences (mixed with occasionally subpar voice deliveries), but it is generally an enjoyable adventure. There is an unbelievable amount of unnecessary dialogue in Metro Exodus. This is not by any means a bad thing, as it really helps to bring depth to each character that Artyom encounters during his adventure. Even minor characters have a surprising amount of dialogue, which helps to make the world more believable. Of course, this means that there is plenty of necessary dialogue, which helps to move the story along. While most of the voice acting is serviceable, there isn’t really a standout performance. Some characters’ delivery felt kind of lifeless, as well. Unfortunately, the game engine also fired off lines at the wrong time on a fairly regular basis, leading to plenty of situations where characters spoke over one another, leading to a confusing conversation for the listener. A few other issues cropped up from time to time during our time with Metro Exodus. For starters, load times between levels are pretty lengthy, even on the PS4 Pro. Granted, this is 4A Games’ first open-world game, and as such there are probably some hurdles to get through when it comes to streaming large areas such as those seen here. While Metro Exodus also features a generous auto-save system, it can occasionally grind the game’s frame rate to a halt. Additionally, some intense smoke effects can hamper the otherwise smooth gameplay. The world of post-apocalyptic Russia does look great in Metro Exodus, no matter the frame rate. 4A Games’ engine renders at up to 4K resolution, and includes HDR that can really be appreciated in the open levels. The first open level, Volga, has magnificent skylines that ramp up the color intensity noticeably. 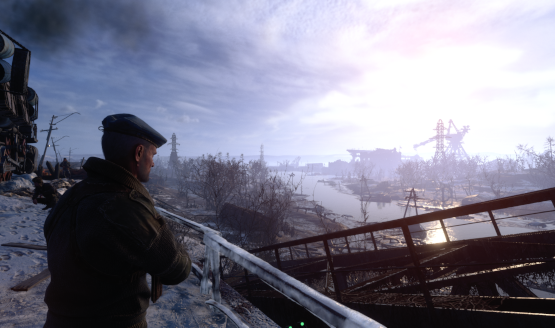 Open-world games tend to have lengthier-than average play times, and Metro Exodus is no different in that regard. Gamers should expect to sink around 20 hours of their time into the main campaign, and perhaps an additional 10-15 hours to see all that each area has to offer. There’s even a helpful collectibles menu option to check progress on finding all notes, audio recordings, and other items. As usual, it depends on each player’s individual play style, and especially if going for a stealth run is the goal. Even players who aren’t fans of open-world games should play Metro Exodus, as it’s only as open as you make it—it’s very easy to progress the story linearly. Yes, stealth is still an option in Metro Exodus. Artyom has a handy device on his wrist called a bracer, which has multiple purposes. It displays the time of day (since there is now a day and night cycle to contend with), or remaining “life” of a filter if the gas mask is equipped. A compass can also be equipped, which can help to find the next objective when traversing the open levels. But one of the most important gadgets on this wrist multitool of Artyom’s is the stealth indicator. It’s just a single LED. But if it lights up, it means you are currently visible to enemies. What’s more, the DualShock 4 LED lights up in the same manner, a unique perk of playing on the PlayStation platform. In fact, the DualShock 4 reacts to the visibility level a noticeable fraction of a second faster than the in-game indicator, which may give some players the edge they need to succeed. Honestly, it almost feels like cheating to know just how visible you are to the enemy, but it’s a cool device that has a ton of functionality, and it can be upgraded throughout the game. Speaking of upgrades, Metro Exodus is chock full of odds and ends to find throughout each open level. Fallen enemies will drop their weapons, and even if you don’t want to swap, you can always take the ammunition in the gun, which takes a few seconds longer than swapping but is usually worth the effort. Mods such as various scopes, grips, barrels, optics, and more can also be taken or found, and applied either in the field or at a workbench. Artyom carries a backpack which he can use at any time to upgrade his equipment, or craft med kits. But this inventory management is done in real-time, as the game does not pause during these moments. That means there is a real risk of getting ambushed while attempting to make a med kit or install that fancy new scope you just found. Going into an unfamiliar area without such things already taken care of can be deadly, and having resource management be done in real time adds to the tension in a great way. 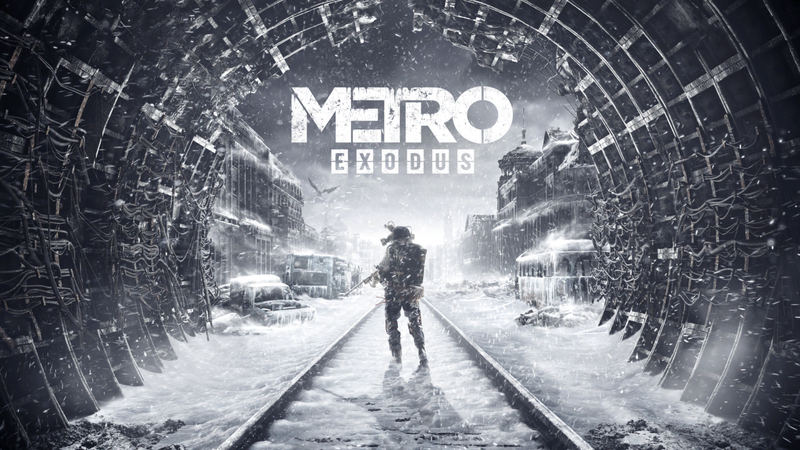 The survival aspects of Metro Exodus are evident in nearly every aspect of the game’s design. When playing on normal difficulty or higher, bullets become scarce very quickly. They also require a decent amount of resources to craft, resources which are also partially consumed when creating med kits. So there’s a careful balance players must maintain in an effort to wisely use their resources. Most human enemies will only take a few shots to kill, but then so will Artyom until he finds or makes more durable armor. However, the mutants roaming the open levels take several shots to take down, and they don’t tend to leave any loot behind. Thus, Metro Exodus quickly teaches players to avoid fighting the wildlife unless it is absolutely necessary. Metro Exodus is an entertaining post-apocalyptic shooter that isn’t afraid to take chances with the series’ formula. There are still occasional jump scares, resources are scarce, and often times humans are your worst enemy. The addition of large, open levels really freed up 4A Games to make a world all the more detailed and believable. A few technical issues hold the game back a bit, but they are by no means a deal breaker. Fans of the Metro series shouldn’t hesitate to pick up Metro Exodus at launch, and fans of survival horror should also find plenty to like here. Metro Exodus review code provided by the publisher. Version 1.00 reviewed on a standard PS4. For more information on scoring, please read our Review Policy.